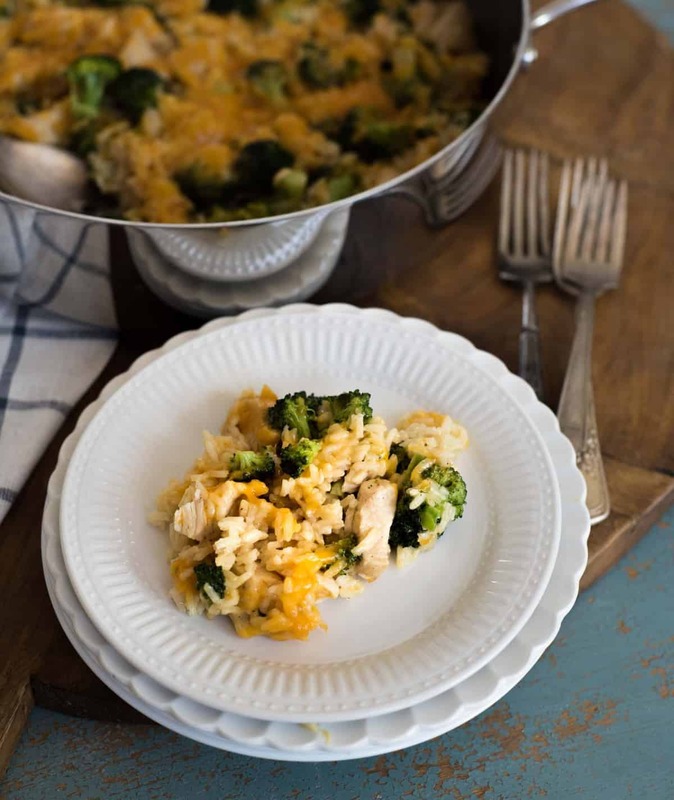 Quick and easy One Pot Chicken Broccoli Rice Casserole that is on the table in only 30 minutes. I’ve been working on making more quick and easy meals for you all and this is one of our all-time favorites, so I thought it was high time that I shared it with you. 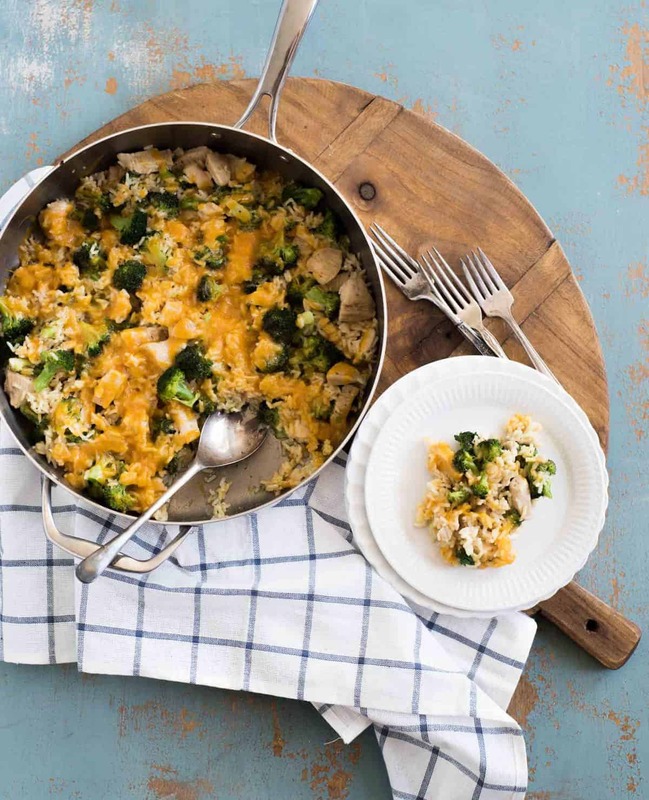 Chicken broccoli and rice casserole is a classic dish that so many families love. 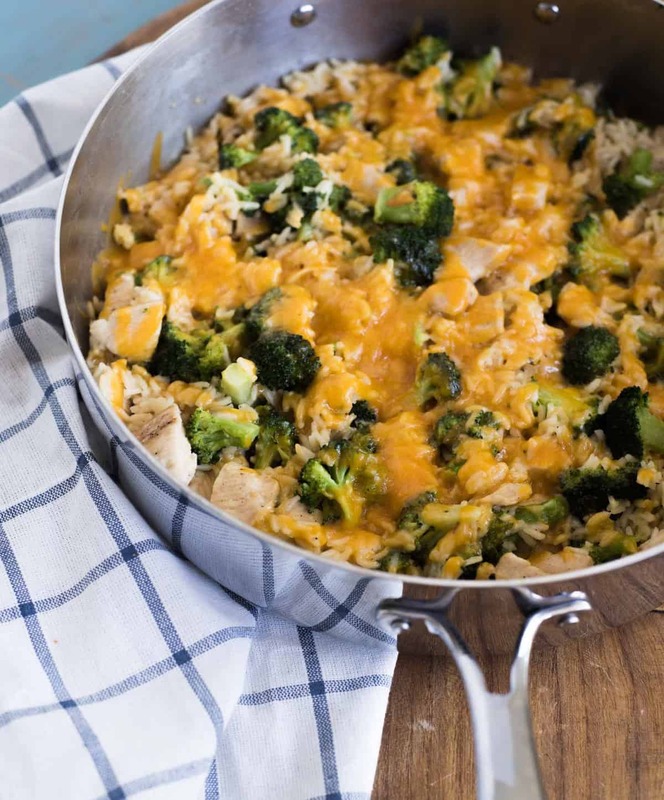 My kids love the rice, cheese makes everything better, and who doesn’t love nicely seasoned chicken and broccoli to go with it all? 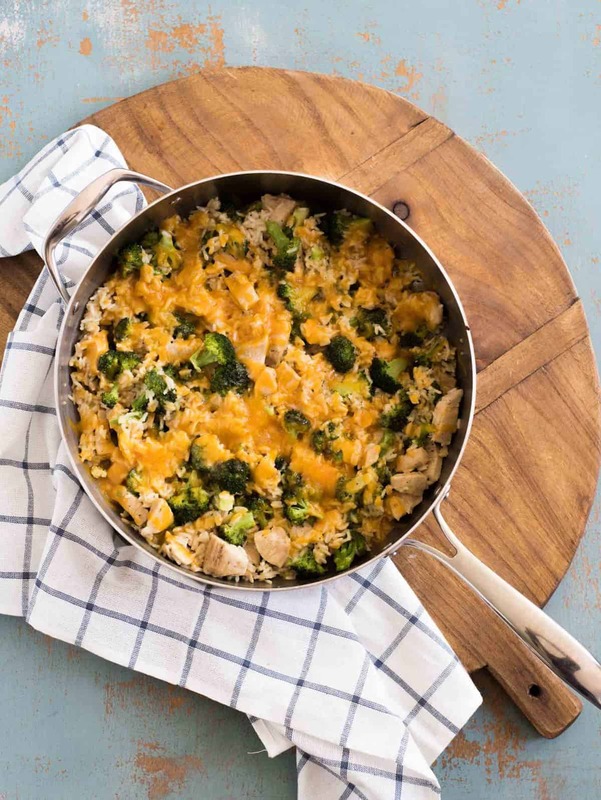 The fact that it all cooks together means the dish is a one-and-done kind of meal (it includes your protein, grain/carb, and green vegetable all in one place). Add a side of fresh fruit and your favorite green salad and you have yourself one simple delicious meal. I love having one pot meals up my sleeve (especially ones that are quick) so on nights that dinner time hits me sooner than I was planning, I have a recipe I can turn to that I know my family will love and that I can get on the table in a hurry. 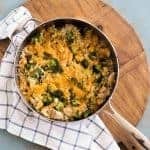 Chicken Broccoli and Rice Casserole is a favorite because chances are good I have everything on hand to make it. Long live meals made from pantry staples! This version is the best because it’s super quick to make, taking only 30 minutes from start to finish. It’s all made in one pot on the stove so you have fewer dishes to wash.
No cans of cream of something soup here. Am I the only one who avoids those? The rice is super fluffy and full of flavor since you cook it with broth, garlic, onion, and butter. No chicken broth on hand? Better than Bouillon mixed with water works great too. Brown rice will not work with this recipe. It takes a really long time to cook and much more water than this calls for. Save yourself the headache and don’t try to make it work with brown rice. This is really good with a little hot sauce on top. You can sub frozen chopped broccoli for the fresh in the pinch. I like to run the bag under a little warm water before adding it to the pan so that the frozen broccoli doesn’t slow down my cooking time too much. In a large skillet or pan (I used a 12 inch skillet), over medium-high heat, add 2 tablespoons of the butter. Add the onion and cook until the onion is softened and translucent, about 4 minutes. Add the chicken to the pan and cook until no longer pink, stirring often. Push the chicken mixture to one side of the pan and add the remaining 2 tablespoons of butter to the other side of the pan. When the butter melts, add the rice to the pan. Saute the rice in the melted butter for a few minutes, stirring often. Add the garlic and salt to the pan and cook, stirring constantly, until the garlic is fragrant, about 30 seconds. Slowly pour in the chicken broth and combine the rice with the chicken mixture. Bring the mixture to a boil. Reduce the heat to medium or medium-low, so that it’s still slowly simmering, and add a lid to the pan. Cook without stirring for 12 minutes. After the 12 minute cooking time, add broccoli and stir to combine. 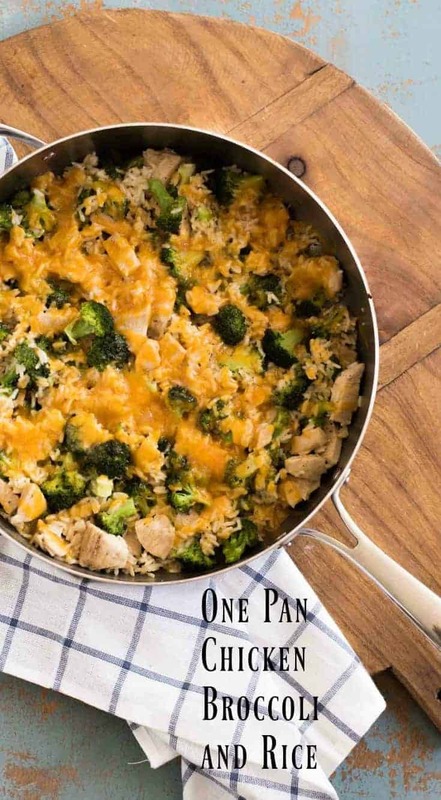 Replace the lid and cook an additional 8 minutes or until the broccoli and rice are both tender. Remove from heat and add ½ cup of the cheese and stir to combine. Add the rest of the cheese to the top of the dish. Add the lid and let the dish rest until the cheese melts, about 3 minutes. There are a whole lot more quick and easy dinner ideas hiding in my archives if you want to dig around. Click here to access my visual recipe index. Happy cooking fellow busy families! I hope this recipe and the others included help make your day a little simpler. Ohhhh! Quickie meals for when company is here! I like!!!! 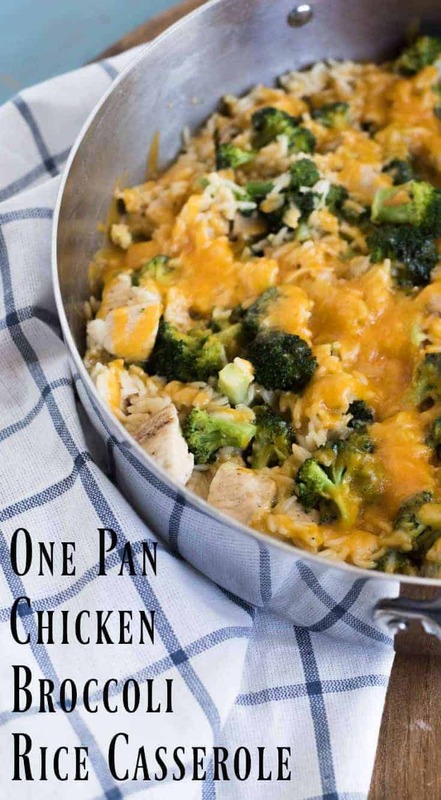 One pan to clean….I double like! Thanks! This was WONDERFUL! My entire family had seconds. That’s rare! They agreed that this is a keeper and would love to have it again. Woohoo!! Having a dinner your people want to eat is always a success in my book! Thank you for leaving a comment James! Made exactly as written and this turned out fantastic! I was hesitant as other recipes used milk and wondered how this would turn out, but your recipe was amazing. The rice cooked through and it all tasted as good as it looked. Easy cleanup and simple to make. Thanks for the great recipe. I love hearing that! Thank you for taking the time to leave a great review!